This short vignette speaks to the popularity of Thomas Edison as a figure and also to the relationship that his film studio had to him. Not a location film or an actuality, this is a staged performance to confirm the image of Edison in the public mind as a genius and creator. We see a set against a black backdrop, with bottles and tubes and various chemical paraphernalia. At the center of it stands Thomas Edison, a large, imposing, and dignified figure in a long white coat. He picks up a bowl and stirs the contents, putting it back down on top of a Bunsen burner. 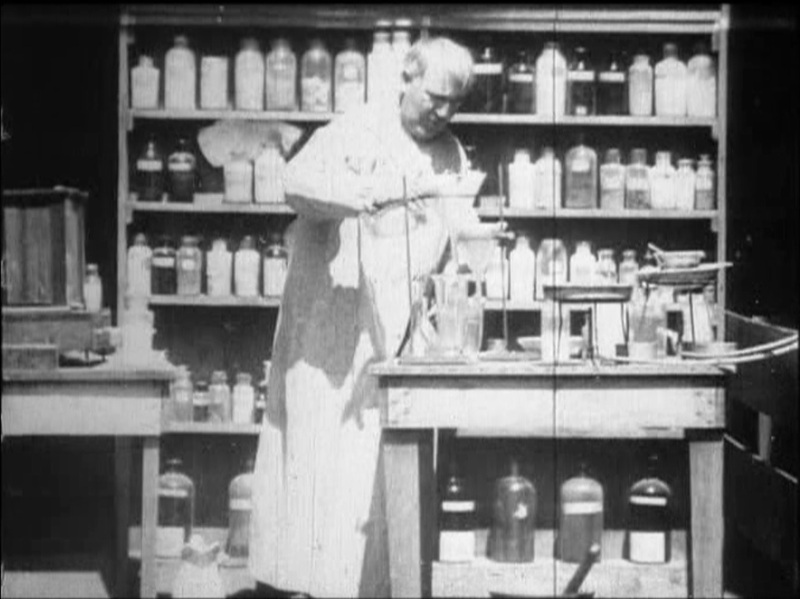 He then picks up a large test tube and begins to pour from it into a series of funnels before the film ends. Charles Musser, in his commentary from “Edison: The Invention of the Movies,” says that this film was used as a kind of “signature” for screenings of Edison films, often shown at the end of a presentation to make sure the Edison brand was firm in the mind of the audience. He also points out that the attachment of Edison’s name often gave audiences the sense that he was directly responsible for making the films, perhaps even running the camera, which was certainly not the case. As with many of his firm’s projects, his involvement was more administrative and indirect. Musser refers to it as a kind of “paternalistic oversight.” Certainly he was interested enough to come down to the Black Maria and participate in this film shoot. From the studio’s point of view, the Edison name was a big selling point for their products, and they wanted to play up his myth (and maybe even the perception that he was making the movies) as much as possible.